Quilt, Knit, Run, Sew: First Fiddleheads of the year! YUM! This sounds so good. I love fiddleheads but haven't had them in soup before. I'll have to try it. I came by to check out your jean hemming tute. It's fantastic! I'd love to link to it if you don't mind. ok, so for the other side of the coin... fiddleheads are stinky gross and slimmy! They smell like peas... ewwww... But Fiddleheads always give me good memories of my dad bringing them home by the green garbage bag full, and mom "blanching" them and then freezing them in baggies by the TON. So, there you go... two sisters ... two sides of the coin! I LOVE fiddleheads! It makes me think of my Mom! We both love this time of year because it's fiddlehead season! I'm going to go looking for some around here! Yum! Enjoyed your post; it reminded me that I have a copy of that cookbook! Sure do love fiddleheads, although I've never tried them in soup. 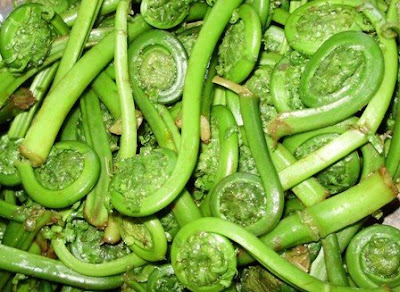 I've got a bag of fiddleheads in the fridge and they are just begging to be made into that soup! Thanks for the recipe!